Patients with extensive peritoneal spread from advanced ovarian cancer often undergo several upper abdominal surgical procedures including subphrenic peritonectomy to obtain optimal cytoreduction. The most common complications are pleural effusions, pancreatic leakage and endoabdominal collections. 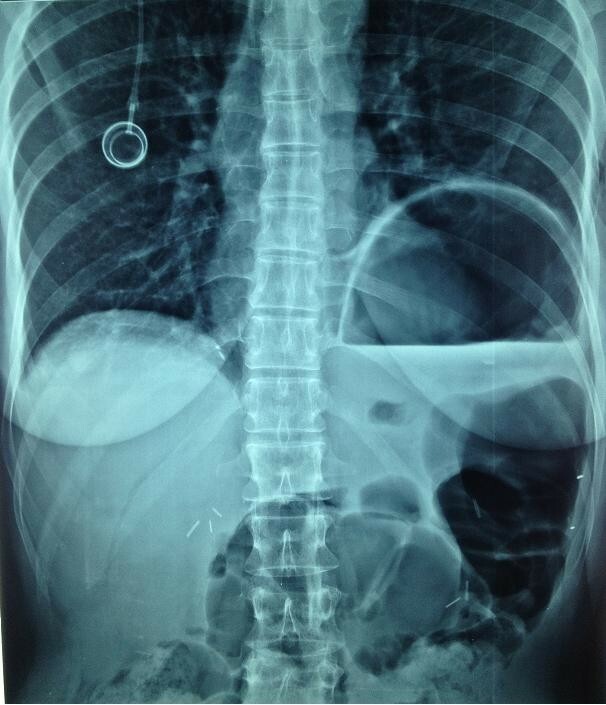 This case report describes an unusual complication, a diaphragmatic hernia with an intrathoracic gastric volvulus developing four months after the patient underwent left subphrenic peritonectomy during interval debulking surgery and hyperthermic intraperitoneal chemotherapy for advanced ovarian cancer. Peritoneal spread is a typical feature in patients with primary advanced or recurrent ovarian cancer. Since the first report by Griffith  multiple retrospective series have shown that survival is inversely proportional to residual tumor size . After a meta-analysis showed that maximal cytoreduction improves prognosis , the criteria for defining desirable surgical outcome in advanced ovarian cancer (AOC) switched from 'optimal debulking’ with variable residual disease up to 1 to 2 cm in diameter, to microscopic residual disease alone. These findings justified more aggressive surgery including, as in other peritoneal carcinomatoses, hyperthermic intraperitoneal chemotherapy (HIPEC) [4, 5]. In patients with extensive peritoneal spread from AOC, bulky upper abdominal disease often precludes optimal cytoreduction thus lowering survival rates . To achieve better cytoreduction rates and improve outcome, centers highly experienced in treating AOC, therefore, now recommend extending standard cytoreduction with extensive upper abdominal surgical procedures, including subphrenic peritonectomy, splenectomy, distal pancreatectomy or tumor stripping from Glisson’s capsule [7–9]. Diaphragmatic surgery includes various procedures, such as subphrenic peritonectomy originally proposed by Sugarbaker (stripping) , coagulating minimal lesions less than 5 mm in diameter or, in patients with extensive spread infiltrating the muscle and sometimes the adjacent pleura, full-thickness resection . Diaphragmatic surgery carries its own specific morbidity, mainly including pleural and pulmonary complications (pleural effusions, pneumothorax, pulmonary infections and the need for intrathoracic drainage). Less frequently, it also leads to morbidity related to the other upper abdominal surgical procedures frequently associated with subphrenic peritonectomy, such as splenectomy or distal pancreatectomy leading to pancreatitis, digestive fistulas or abdominal collections [9, 11, 12]. This case report describing a patient in whom a delayed diaphragmatic hernia manifested after cytoreductive surgery including subphrenic peritonectomy for AOC underlines the need to take this possible late complication related to these multiple upper abdominal surgical procedures into account during postoperative follow-up. A 51-year-old woman was diagnosed with a clinical stage IIIC International Federation of Gynecology and Obstetrics (FIGO) serous ovarian carcinoma in October 2011. Diagnostic laparoscopy showed that debulking surgery as a front-line approach was unlikely to leave no residual tumor so the patient received three courses of paclitaxel and carboplatin neoadjuvant chemotherapy to which she partially responded. When she was hospitalized in January 2012 for interval debulking surgery, intraoperative evaluation showed peritoneal carcinomatosis involving the pelvis, the omentum and the undersurface of both diaphragmatic domes leading to a peritoneal cancer index according to Sugarbaker of 21 . The patient underwent pelvic peritonectomy with bilateral hysteroadnexectomy, appendectomy, cholecystectomy, infragastric omentectomy, bilateral subphrenic peritonectomy and pelvic and lumboaortic lymphadenectomy yielding a completeness of cytoreduction (CC) score of 0 . When the surgical procedure ended, HIPEC was given with a cisplatin solution (75 mg/m2) at 43°C for 60 minutes using the closed abdomen technique. Pathological staging classified the tumor as ypT3b pN0 pM0 G3 FIGO stage IIIB. The postoperative course was uneventful and the patient was discharged 11 days after surgery. The patient received consolidation adjuvant chemotherapy with paclitaxel and carboplatin over the next three months and one month later she was readmitted to the hospital with suspected intestinal occlusion. Radiological studies showed left hemidiaphragm lifting and gastric overdistension but no documentable pathological tissue or abdominal fluid collections (Figures 1 and 2). Emergency laparotomy disclosed a wide breach in the left diaphragm with a gastric volvulus herniating into the chest (Figure 3) but no signs indicating recurrent disease. We repositioned the stomach in the abdominal cavity and directly sutured the diaphragmatic breach (no postoperative pleural drainage was necessary). Histological examination of frozen sections from perioperative peritoneal biopsy samples excluded recurrent disease. The postoperative course was uneventful. The patient soon recovered completely and was discharged after a week. She is now under follow-up and clinically disease-free. Preoperative plain abdominal X ray showing left hemidiaphragm lifting and gastric overdistension. Preoperative plain computed tomographic scan showing left hemidiaphragm lifting and gastric overdistension. Intraoperative photograph showing the wide breach in the left diaphragm. A delayed diaphragmatic hernia is an exceptional complication in a patient with AOC who has undergone extensive upper abdominal surgical procedures for maximal cytoreduction. To our knowledge, the literature describes only three similar left-sided cases, given that the liver usually protects the right diaphragm against this event [15, 16]. Two of these three cases differ from the case we report here because the clinical features strongly suggest that the diaphragmatic hernia arose for reasons only partially related to diaphragmatic surgery. In the patient described by Laterza et al. and in one of the two cases described by Lampl et al. , the colonic fistula that developed in the splenic flexure after cytoreductive surgery caused an abdominal abscess that invaded through the diaphragm into the chest. Equally important, cytoreduction included a left subphrenic peritonectomy only in the patient described by Laterza et al. . In the patient we describe here, as in the second patient reported by Lampl et al. , the diaphragmatic hernias both had a delayed onset after cytoreductive surgery including subphrenic peritonectomy and were both unrelated to other surgical complications. The only difference concerned the clinical onset because in our patient the ruptured diaphragm caused an intrathoracic gastric volvulus necessitating emergency surgery whereas in the case reported by Lampl et al. , although computed tomographic (CT) scans obtained during follow-up showed the diaphragmatic hernia progressing over time; only when the symptoms and dyspepsia increased did the patient undergo surgery. What events cause a diaphragmatic hernia to complicate cytoreductive surgery including subphrenic peritonectomy and HIPEC remains conjectural. The clinical history suggests that in the case we report several causes probably acted in concert. First, peritoneal malignant implants involving the diaphragm presumably injured the muscle and the resulting trauma then continued when the patient underwent neoadjuvant chemotherapy followed by surgery. 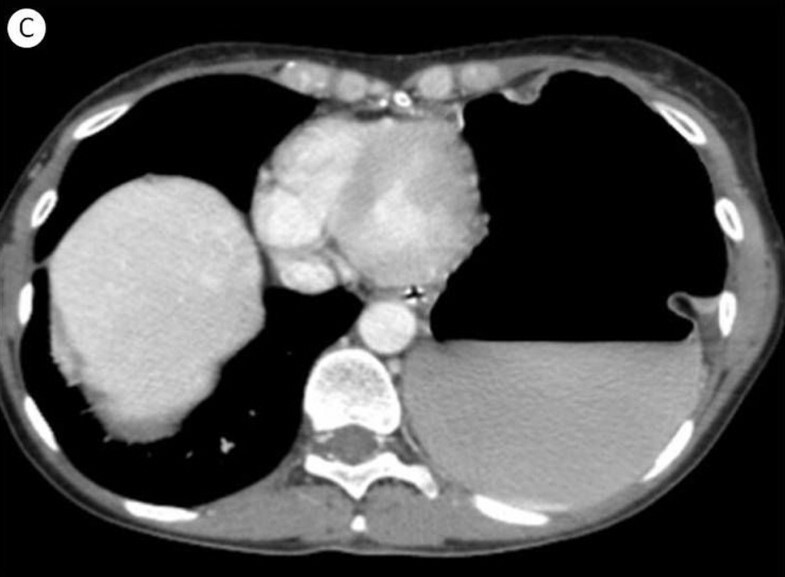 Necrosis in response to neoadjuvant chemotherapy, as others have reported after diaphragmatic surgical procedures done for interval debulking surgery , might play a role in increasing the complication rate. In our patient, the subphrenic peritonectomy done during debulking could then have aggravated the previous diaphragmatic trauma when the high-voltage stripping knife induced a thermal shock. Last, HIPEC done even for a short time with the closed abdomen technique caused endoabdominal pressure to increase, thus further traumatizing the diaphragmatic muscle. 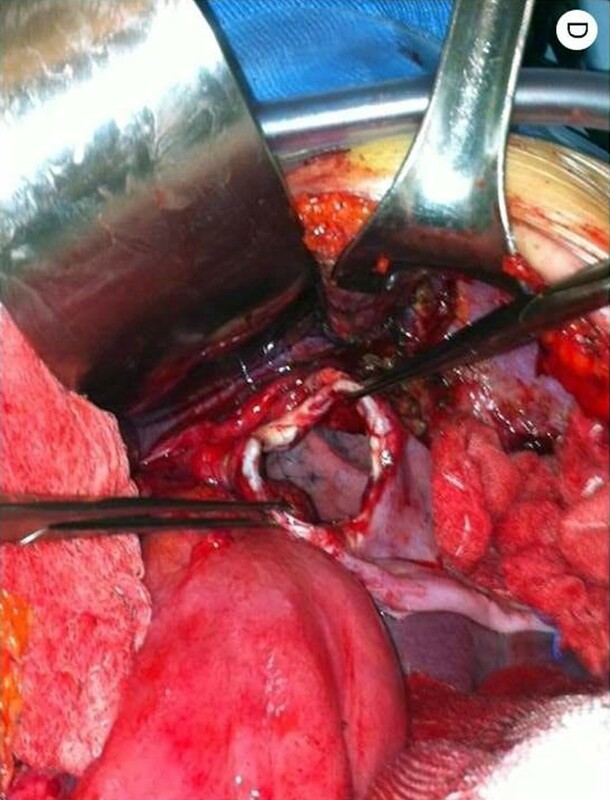 In our opinion, no specific measures can prevent this infrequent complication after cytoreductive surgery including subphrenic peritonectomy except, possibly, carefully checking intraoperatively that surgery leaves the diaphragm intact. As a pathogenetic explanation, we suggest that our patient’s delayed diaphragmatic hernia, like those sometimes developing after blunt trauma , became clinically manifest only when the diaphragmatic trauma devitalized the muscle and caused peripheral denervation, thus progressively thinning the muscle wall and inducing fibrosis until the diaphragm ruptured and the complication turned into a clinical urgency. Our case report serves as a useful reminder that physicians following patients with AOC who undergo a subphrenic peritonectomy, especially patients who have received neoadjuvant chemotherapy, should keep this possible complication in mind. The only possible way to prevent this almost unpredictable event is to check that small accidental diaphragmatic perforations left after peritoneal stripping are not overlooked and remain unsutured. “Written informed consent was obtained from the patient for the publication of this report and any accompanying images”. All authors contributed equally to conception and design of the study, analyzing and interpreting data, drafting and revising the manuscript. All authors read and approved the final manuscript.